Since this was to be my son's first car, he ponied up some cash, my wife and I ponied up some cash and our family put up some cash and we purchased the car and drove it home. We wanted to help him get something that would last... Not to mention, I didn't want another "car note" and I knew my son didn't either! But it was now his, lock stock and barrel. No worries about the "repo-man"! Now that it was ours, we could do with it what we wanted to. We needed to remove the "light bar" on the roof. In Texas, you can't have one of these big flashing LED light bars unless you are an EMT, volunteer fireman, wrecker or other emergency first responder type. Not to mention, at 70mph on the highway - it literally HUMS and makes the roof vibrate like a big snare drum, which can get awfully irritating after a while. It is sort of hard to describe, but you definitely get a physical reaction after a while. It's a noise that can get the fillings in your teeth to vibrating - and that's not a fun feeling! It just simply needed to come off so he wouldn't get any grief from the county sheriff or the local PD. After removing a few screws on each of the side brackets and unplugging everything from inside the light bar, it came right off of the roof with little trouble, leaving us with a big fat pigtail of cables sticking out of the roof. 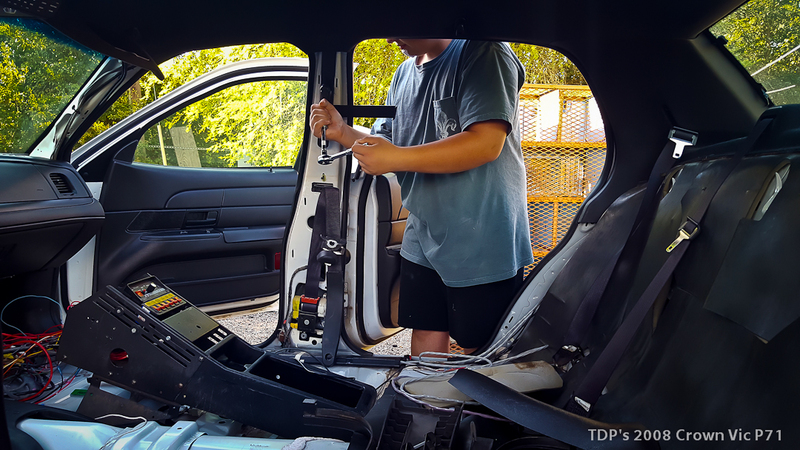 We had to disassemble the inside of the car so we had access to the headliner and carefully pulled the cables inside the car and tucked them inside the headliner. We stuffed a big plug of "dum-dum" in the hole until we can get to town and get a properly sized rubber plug to silicone into place. The roof looked pretty good after the surgery and removal. But we definitely have some paint issues to address. When I say we disassembled the interior of the car, I mean we really disassembled the whole interior of the car! First we removed the rear seats. Then we removed the steel bars on the back windows. Then we removed the prisoner partition between the front and back. It's like a roll bar with armor plating behind the front seats with a plexiglass window unit. (OMG that thing was heavy! The armored metal panel was more substantial than we first realized...) We removed the front seats next. We removed the plastic trim from numerous places too. 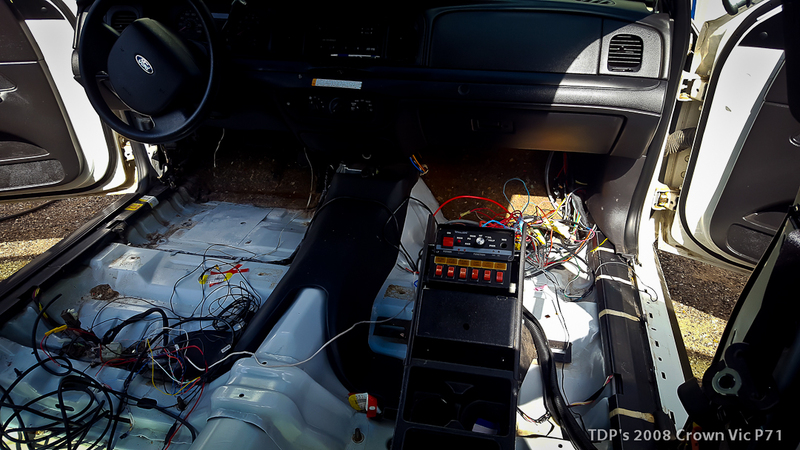 We removed the floor mat and insulation and we were down to the metal and the wiring... 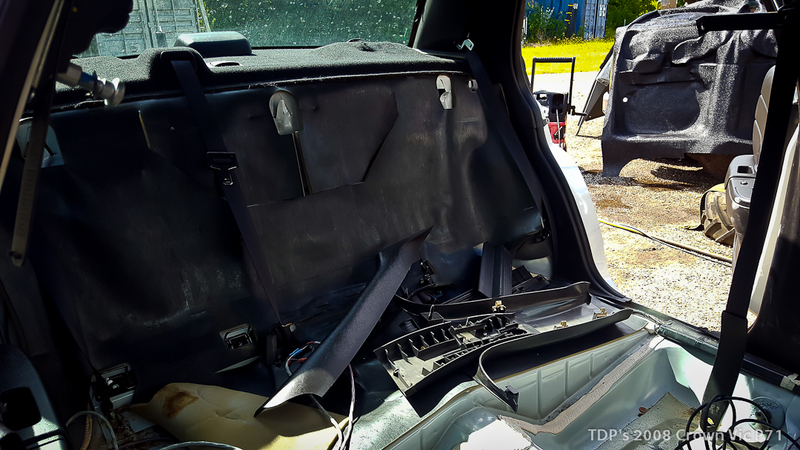 While we were at it, we did some repairs to the seat belts and trim while it was all apart. It is always amazing to me the things you will find when you do this... It's almost like an archeological dig! Literally years worth of loose change, soda straws, sugar and salt packets, FRENCH FRIES, notes and business cards even. I laugh at the knives, tools and all sorts of things that get "lost" inside a car over its lifetime - and we found it all! My son now has a really nice new $150.00 knife thanks to the Brady PD! Some police officer lost it under the drivers seat. Finders keepers right?!? We were also looking for evidence of flooding, windshield leaks and hidden rust you can't see from any other angle. Luckily, no leaks, no flooding evidence (no mold!) and everything looked like it should. However, we had a LOT of wiring under the floor mat that no longer has any reason for being there... That "big fat mystery lump under the floor mat" had to go! We cleaned everything, and I do mean CLEANED everything...! We didn't want to destroy the cop car look completely. We wanted to leave SOME of the stuff inside that makes it look like a cop car. But we needed to disable a lot of it because all of those options had been removed. In a project like this, you DO NOT just go and start hacking wires and stuffing them under the carpet! Doing that to some of these high amperage control circuits could cause a fire later! We needed to do it carefully, do it right and make sure everything was SAFE. Besides, some of those switches and control circuits can control other things later! 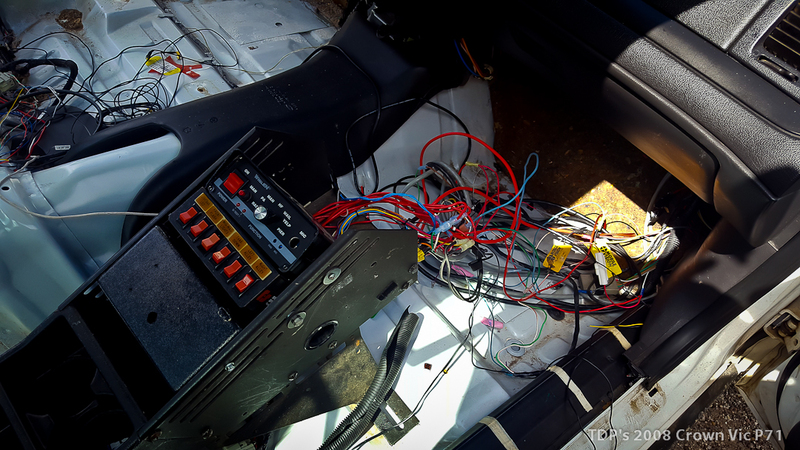 In the end, we ended up with a big pile that turned into big box full of old wiring that needed to be removed. Thankfully, eBay and Amazon still sells a lot of pieces and parts for these cars! There's not much you could do to this car that there isn't a YouTube video posted about. 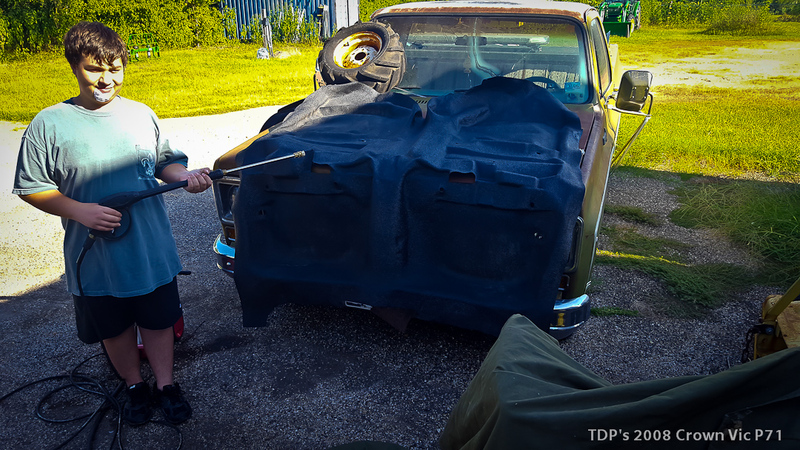 Luckily, people have shared their knowledge on DIY projects for people to be able to service, modify and work on these cars - exactly what my son needs for his first car, to LEARN from! The rest of the car was a mechanics challenge. It became rather obvious that the previous owners did very little maintenance to this car other than what they had to do at the local oil changing place. They just simply drove it. Which left us the job of bringing it back from the brink of death. We started by power washing or otherwise cleaning everything, top to bottom, end to end, inside and out. The rest was days of "a few hours at a time when the sun allowed it". 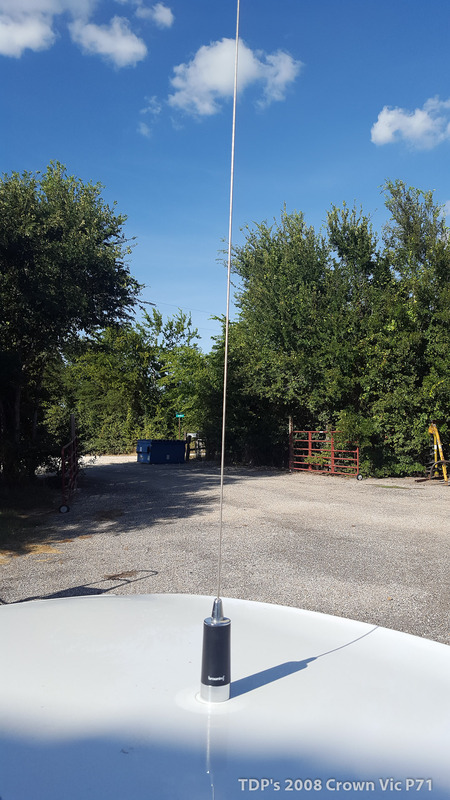 Working on a white car on black top pavement, next to a big silver colored sun reflective barn in the mid day sun during July down in South Central Texas will make you question your own sanity at times... August is going to be even worse! Working at night is no fun either with thousands of bugs trying to make love to your lighting apparatus! We went through and replaced the "almost worn through" brake pads and resurfaced all the rotors on the four wheel disc brakes. We bled the brake lines, over and over again until the fluid ran out nice and clean and clear. We literally put at least a half gallon of brake fluid through the lines before everything was back to normal! The old stuff was downright BLACK! We got the ABS module replaced as it was no longer working. The brakes work great now! We replaced ALL the fluids - radiator, oil, transmission fluid, differential fluid, power steering fluid, etc. We had to replace the plastic window washer reservoir that had gotten frozen and cracked at one time and now the window washers actually work again! 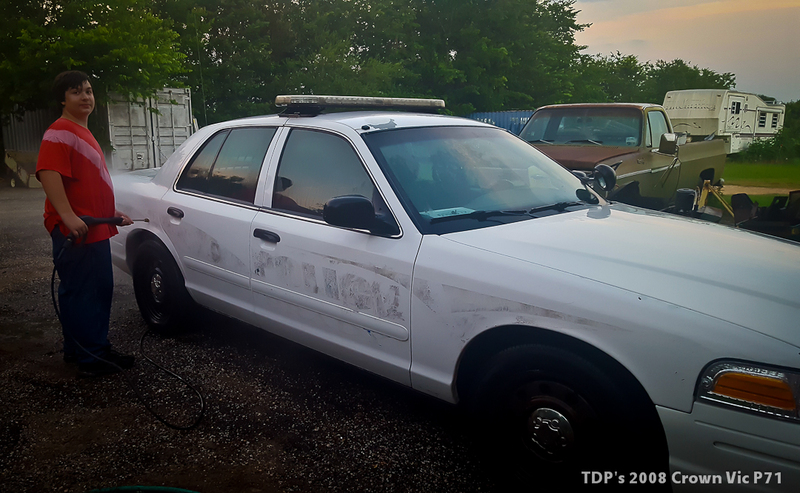 We purchased a new rim off of eBay (to replace the ONE missing one) and went and replaced all FIVE tires with new "extreme duty" Michelin 90,000 mile rated police radials. At the same time we got all the tire pressure monitoring modules working again. He shouldn't have to replace a tire in the next 4-5 years, if ever! 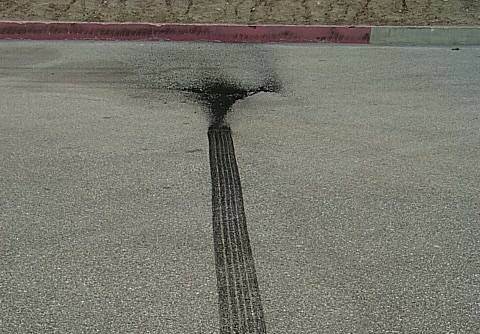 We had a mechanic align the front end and repair the damage from going over curbs and a possible light front end collision, earlier in its life - now the front end is straight as an arrow and plows down the middle of the road for miles with no hands on the steering wheel at all... The shocks and suspension are all now in great shape... It does doughnuts quite well now - but don't tell my son that! Once we tore into the engine, it was easy to understand why we had a few pesky little problems. Some were inter-related. The previous owner had done very little regular maintenance other than changing the oil. We replaced all the spark plugs AND the coil packs that drove them. Most of the OEM plugs didn't even have much of any of the electrodes left! Some looked fine, some looked like they had been burnt right off. The coil packs proved to be weak and since we had one that was intermittently dead and two others that were questionable according to the computer, we replaced them all from ones purchased off of Amazon.com. 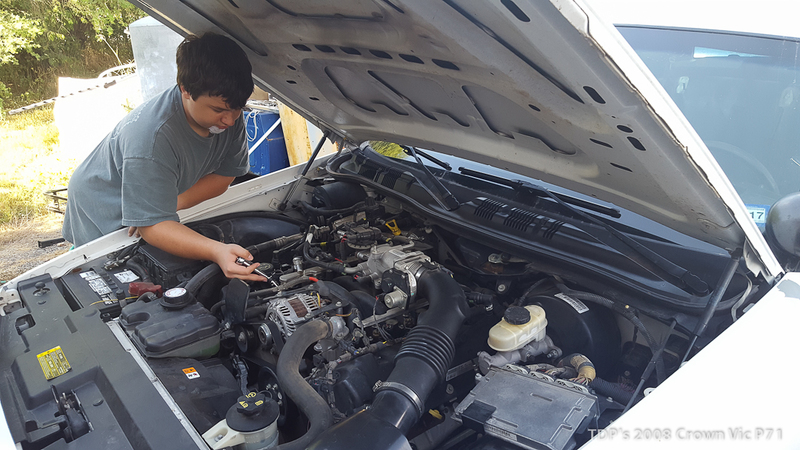 We replaced the cracking, old and tired serpentine belt and figured out that the tensioner was TOAST! It was so bad off that it was actually floppy and had no real spring tension to it at all. We replaced that too! Now the AC compressor is no longer slipping and the AC system now blows icecubes! The alternator isn't slipping anymore and our intermittent charging problems went away! The power steering works better now too, all it takes is one finger to drive this down the road and make turns... We did a fuel injector cleaning procedure and put a bottle of seafoam in the tank and a little in the engine oil. The engine even sounds different now. 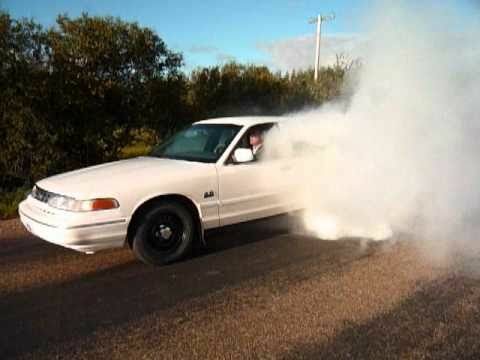 Now instead of a brown plume of smoke out of the tail pipe when it starts, you don't see anything! Now it starts with no clatter, on the first turn of the key - something it did not do when we purchased it. 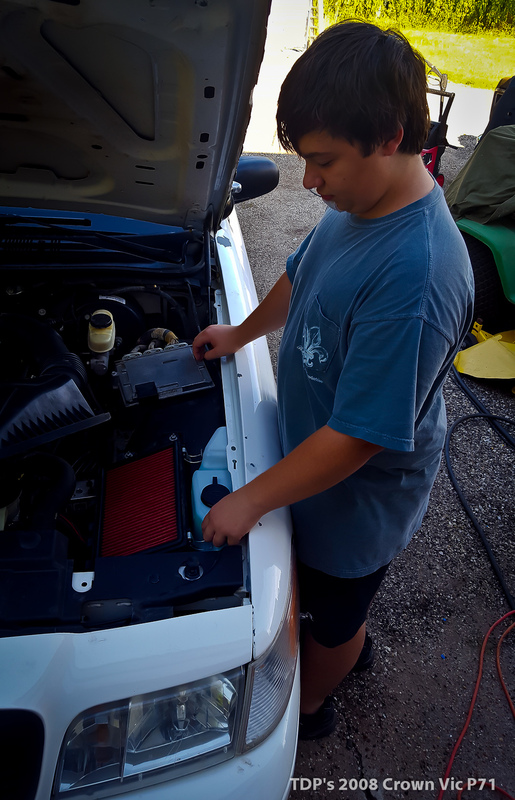 We also cleared years of crud, leaves and dirt out of every nook and cranny of the engine compartment - showing us a few wiring problems that we fixed right away. Most of the wire loom coverings are all rotting off. We will address that later, after we get everything working as it should. We are leaving the non-working digital video recorder system on the windshield and headliner in place - for two reasons, it came with the car, and, more importantly, we don't have the weird special KEY it takes to remove the covers to access the brackets so we can remove it from the car... So, instead, we will be replacing it with a much smaller unit, with GPS, mounted to the windshield that is about the size of a pack of cigarettes that records video and audio in 1080p along with GPS data! Now the car runs like a top! It shifts like it is supposed to, where and when it is supposed to. And better yet, it STOPS like it should too! When we originally tested the car, it would accelerate (poorly), but it wouldn't lay down any rubber. Now it lays down rubber with Nooooo problem! It isn't brawny and over powered like a hot rod, but it now has plenty of power, just like it should. With all the recent brake work, it stops as well it goes now too! 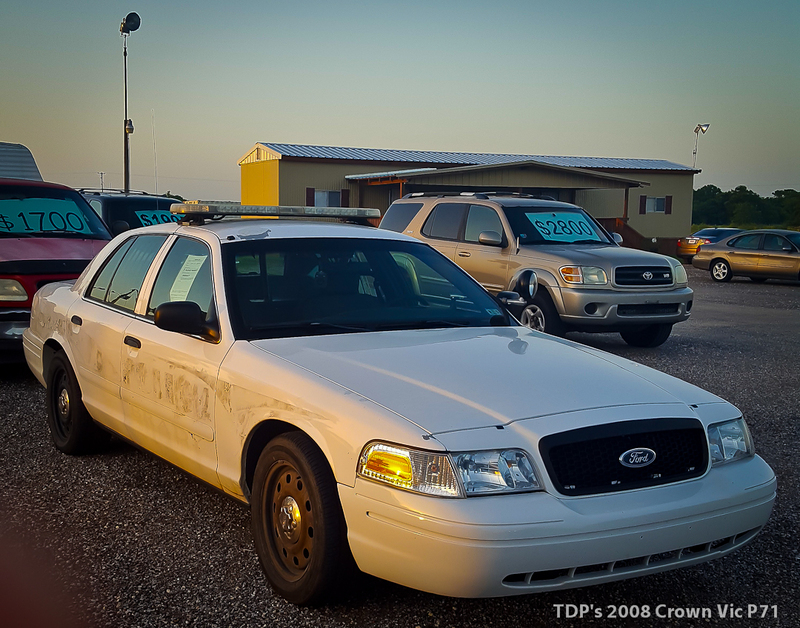 These cop cars are no slouch when in good condition. They are built to RUN a long time, be reliable and be tough as nails. However, they are sort of old school - they have no internal governer in the computer. It will go as fast as you want it to - right up to and including the point where you can blow an engine... The speedometer goes to 140, and after some work, I have no doubt that it will probably do that, if not darned close to it. Shhhh - don't tell my son!! The performance of the engine, transmission and braking systems are all back where they need to be, just like it came out of the factory. 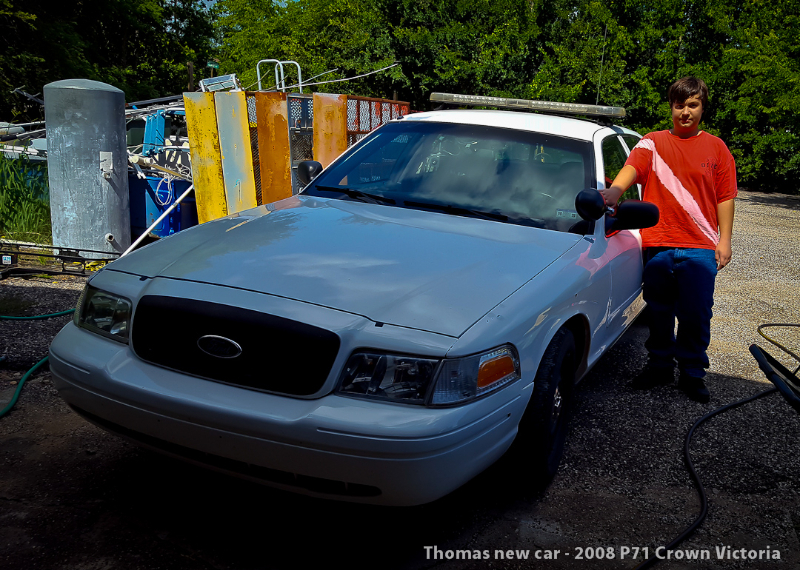 He now has a safe, reliable retired cop car of his own that he can drive throughout his years in High School that we wont be staying up nights wondering if he can make it home or not. A car he bought with his own money, with a little help. A car he will work on when he needs to and learn from. A car he may learn to love, take care of and cherish. Personally, now that we have done what we have done... I wonder what it would do out at the drag strip... But don't tell my son that! Brake upgrade project - Amazon to our rescue!